The “show floor” is usually the focus of industry trade shows/conferences, with the conference track serving the concerns of the exhibitors and attendees that spend most of the their time in the booths and aisles of the show floor. Trade show 101. But SXSW, and its attendees, like to break the mold on just about everything. For a variety of reasons SXSW Interactive, that just wrapped in Austin, has always been more about the hundreds of panel sessions and solo presentations and keynotes far (sometimes very far) from the show floor. The “trade show” floor at SXSWi has not in past years been impressive. There is just so much conference, meet-up, keynote, sponsored events, Awards, and other activity at SXSWi that there has not been that gravitational pull to the show floor itself that you see at most “trade shows”. Most of the big players at the conference sessions are not typically on the show floor in booths– you have to track them down in sessions, at company parties, at bars, at pop-ups– wherever you can. It’s SXSW after all. This year’s SXSW Interactive was the best in years, with hundreds of sessions addressing all things Interactive, and with some big tough issues– privacy, big data, marketing at-retail, content marketing– as well as all the fun stuff like wearable technology and film/music/interactive industry crossover– being addressed by some top players across all media. Did all that spill over onto to show floor? Not as much as we’d like, but some did. Interestingly, I bumped into a very active company on the show floor– with a busy booth– that crosses over the social media and traditional digital signage and Digital Out of Home divide. The company is Postano. In fact, Postano was on a panel session earlier in the week at SXSW Interactive, Social Media Playbook: Activating Fans on Gameday, where they presented some case studies that explained how consumer expectations and behaviors at events have changed dramatically in the past five years– and how those expectations are being met at sporting events. According the Postano and the other panelists, Wi-fi is now a requirement, fans check-in and order food with apps, and Instagram photos and selfies are the new proof that you attended a game at the actual stadium or arena. But key to it– the best part– is that they are using big screens in the venues to create the experience. It's not about thousands of random posts. It's about bringing all that together on huge digital screens to create the experience. The panel was part of SXSW Interactive, but it was also part of SXSW Sports, the new off-shoot of Sx– “South-by”. It’s hard enough to explain the mashup of SXSW Film, SXSW Interactive, and SXSW Music to all the industry people who have not been here. I won’t try to explain SXSW Sports– new to last year’s Sx and continued this year– other than to say that’s it’s an intriguing new addition, although in an odd-numbered year there was not, this year, the buzz from the Soccer World Cup and Olympics that there was in 2014 (you see the same odd-year/off-year phenomenon at the NAB show/conference in Las Vegas, but add election year/not year into the mix at NAB). That being said, this year's SXSW Sports actually had a more full line-up of technology sessions including some serious discussion of how the professional sports leagues are using content marketing that involves video at the highest levels. (Left to Right) Brian Cheek, Director of Business Development, Postano; Grace Hoy, Social Media Coordinator, Sun Devil Athletics at Arizona State University; Pat Donahue, Dir, Digital Media, LAKings Hockey Club; and Meghan Ryan, Social Media Manager of the Boston Red Sox, for the SXSW Interactive and SXSW Sports panel, Social Media Playbook: Activating Fans on Gameday. Postano is very involved with the LA Kings of the NHL. When the LA Kings wanted to get last season started off right with a fresh and active social campaign, #WeAreAllKings was born during the first game of the season, where the hashtag was promoted on the LED walls of the Staples Center. Fans were invited to participate by posting to Twitter and Instagram with the new hashtag. The chosen photos animated throughout the game, along with sponsored interstitials, creating massive excitement and participation. Arena display featured: Single-post visualization, Twitter ribbon banner, and Sponsored interstitials. Postano, the Portland-based content creation and content management company, delivered the social media/digital signage solution. The social displays of the LA Interactive campaign were powered by Toshiba and TigerLogic's Postano Platform. Pat Donahue, Dir, Digital Media, LA Kings Hockey Club was on the SXSWi panel also, and talked about the social media/big screen marriage at their events. Also discussing the topic were Grace Hoy, Social Media Coordinator, Sun Devil Athletics at Arizona State University, and Meghan Ryan, Social Media Manager of the Boston Red Sox. Nice to see big screen activity at SXSWi, where there is so much small screen (Smartphone) obsession. So it was even nicer to see Postano on the show floor at SXSW Interactive– with hardware as well as software. Great addition to the event this year– would love to see more providers of larger screen magic at SXSW Interactive in coming years. 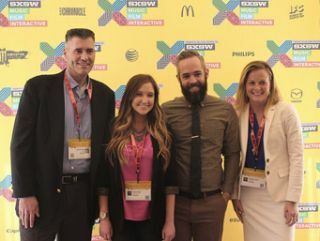 No matter how far down the Smarphone App path we all go, the magic is still in media cross-over, cross-platform, omnichannel– indeed all those buzzwords that made us all come down to SXSW to begin with.